This article aims at investigating the connection among science of law, moral obligation and the theological concept of the relationship with the neighbour in a new way. First, it brings into question the limits of the modern separation between law and morality. The notion of moral obligation and, consequently, the connection between freedom and justice characterize the fundamental category of human responsibility, which is the basis both of morality and legality. In the constellation of modern society the individual foundation of moral obligation establishes itself in connection with the anonymous sovereignty of the economic rules, which govern social relations. This contradiction demeans the force of moral obligation, which is the basis of individual human dignity, and enhances the anonymous power of the utilitarian and technocratic policies of the social bond. This paper emphasizes the importance of the high mediating function of law in society. Law represents a concrete mediation among the political utopia of community, the Christian prophecy of agape and the moral obligation of justice. Therefore it does justice to the human quality of relationships, which should be a common purpose and need of every communities. The concordat policy of John Paul II provides a strong impetus to enhance the role of Bishops’ Conferences and their regulatory function. On the basis of occurred conventiones, these organisms conclude agreements on various subjects (education, spiritual assistance, cultural heritage). To understand the significance of the action of the Bishops’ Conferences with the public authorities, it is important to take into account the relations not only with nations, but also with other political societies. This is a particularly evident reality in the European Union, where the presence of the Church is ensured not only by the Apostolic Nuncio to European Communities, but also by the Commission of the Bishops’ Conferences of the European Community. The 1983 Code of Canon Law is mainly the result of evolutive interpretation in the light of the Second Vatican Council “aggiornamento”. The convergence between pastoral and law in the field of marriage – as consequence of such evolution – arises thank to some very important novelties: the definition of marriage as a “matrimonial covenant, by which a man and a woman establish between themselves a partnership of the whole of life and which is ordered by its nature to the good of the spouses and the procreation and education of offspring”; the widening of the object of consent from “ius in corpus” to the persons of the spouses; the pastoral care and those things which must precede the celebration of marriage; the new concept of “good of the spouses” and also the new canons about the incapacity of contracting marriage or the marriage deceived by malice. Between open problems: “defectio formalis ab Ecclesia”, “intentio contra sacramentalem dignitatem”, “intentio contra bonum coniugum”. 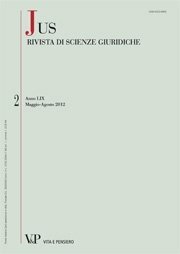 The essay is inspired by the volume of Mario Pisani, mentioned in the title of this contribution, that retraces the insertion of Cesare Beccaria’s masterpiece – On Crimes and Punishments – into the Index of Forbidden Books, due to the selection of the appointed Ecclesiastic Congregation. Specific attention is recalled by the recent identification of some related documents and, in particular, of the votum, written by Fr. Lazeri SJ, according to which the decision was taken on February 3, 1766. The paper examines Fr. Lazeri’s three argumentations that were not directly related to the theme of the humanization of criminal sanctions and to the issue of death penalty. Rather, these nuclei of reasoning took into consideration Beccaria’s work as an utilization of references ascribable to the Protestant cultural environment, as the evidence of the discontinuity of the philosopher’s proposals with the practice accepted by the Catholic Church, with particular attention to some marginal observations present in the work that were regarded as reprehensible. On this basis, the Author of the this essay analyzes, for comparison, the position expressed on death penalty in the Catechism of the Catholic Church, specifically in the Editio Typica (1997). On this subject, it is deemed that such a position considers extinct nowadays the conditions that may in theory, according to text no. 2267, allow the use of death penalty as a self-defense case. Indeed, it is upheld that the death penalty has nothing to do with self-defense that pertains to the contrast to an underway offensive conduct. The conclusion is the expectancy, also given various positions in favor of the abolition of death penalty expressed by the last pops and bishops, that the text of the Catechism could evolve toward the strict affirmation of the inadmissibility, also in principle, of the capital punishment. This would sound also in accordance with the theological reflection of the past few decades on the restorative and redeeming meaning of justice in the biblical perspective. Although the reform of public employment has not worked properly, the A. believes that the privatization started in 1990s is a scientific irreversible revolution. In 2009 the last step of the reform has not carried into effect yet also because it has not identified the correct legal tools to operate on the implementation faults that have been standing out since 2001. Now a new legal very pragmatic intervention is necessary, by supporting best practices and sanctioning the political leadership when it does not use correctly the collective bargaining and managerial tools. De iure condendo: una lex propria per il Collegio cardinalizio? De iure condendo: a ‘Lex Propria’ for the College of Cardinals. The Apostolic Constitution Pastor Bonus, in the articles 22 and 23 states the possibility that ‘‘by mandate of the Supreme Pontiff, the cardinals in charge of dicasteries meet together several times a year to examine more important questions, coordinate their activities, so that they may be able to exchange information and take counsel’’ so as to see that ‘‘more serious business of a general character can be usefully dealt with, if the Supreme Pontiff so decides, by the cardinals assembled in plenary consistory according to proper law’’. The above-quoted ‘Lex Propria’ does not, however, exist yet. This paper of ours proposes first to give a short and necessarily partial coverage of the history of the College of Cardinals. After this, we wish to relate the decisive moments and the reasons that cyclically have brought about the College’s structural revision. As a consequence, the revision fits in with the hierarchical Church structure. Then, our paper means to illustrate the current debate in the College, above all about the hypothesis explicitly foreseen in the Pastor Bonus Apostolic Constitution and discussed in the last century codifying proceedings. This is the hypothesis of a Lex Propria of the College or, at least, for its collegiate manifestation, which is the Consistory.